First of all, the intense scent of this bar will knock you out. Sweet black licorice to the max, the fragrance will make you happy every time you step into the bathroom. As in licorice confectionery, star anise is what powers the aromatic olfactory pleasure. Then, to assure you the herbal benefits of the whole licorice plant, we’ve added real licorice root to the soap. Long a favorite in traditional and alternative medicine, licorice is reputed to have multiple therapeutic uses from cough syrups to antiviral topicals and more. Thirdly, you will also smell the delicate fragrance of coconut. This note is not a synthetic perfume but comes from super-rich, extra virgin organic coconut oil added for amazingly luxurious moisturizing. Finally, to make this bar truly a black licorice soap, we incorporate ground black walnut hulls to provide both the color and a wonderfully vigorous abrasive. 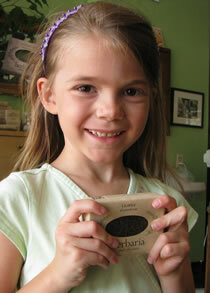 Licorice soap makes Erin McWilliams smile. Love licorice? Try Lavender Licorice, too.